When I submitted the manuscript for Crochet at Play, there was MUCH celebrating. We'd done it! Written a book! Yeah! High FIVE! It was DONE! ...and then I quickly realised that it wasn't. After writing the book, came the task of finishing up samples (with help from Joanne, Jacqui, Rita, Elly and Jessica) for the photoshoots. Preparation for the photo shoots was a more bit fraught this time. The testing process threw up some problems in a couple of the patterns that meant they needed a complete redesign. A women's cardigan had to go as it was too complicated (it was replaced with a shrug featuring in an upcoming issue of Inside Crochet) and a pair of men's socks needed to be resized after it was found I'd used a faulty measurement chart in designing them. Both items were easily fixed. However, running out of time on the socks, I needed to block them on the evening before I headed down to London. Thinking it wise, I put them on the Aga to dry. In the time it took to put the kids to bed, I came downstairs to find a significant scorch mark on the side of one of the feet (an achievement that recently got me a mention in the Daily Mail!) Thank the stars for Photoshop! Photographing my own books is at once the most wonderful and terrifying element of this experience for me. It is a privilage to have that level of creative control, but equally terrifying to work with people who work with some of the best photographers in the world. However, each time I walk into the amazing location houses in London we hire for the shoots, hug my stylist Nadine Tubbs and my editor Vicky, my nerves quickly settle. This time, we added models and a make up artist (GIno D'Campo's makeup artist none the less!) to the mix. I am always intimidated. I am always terrified. I always enjoy it and I am almost always thrilled with the results (I am my worst critic). Over the course of a total of 5 days of shooting, I took about 2,000 photos which all had to be edited and turned around within a week of the shoot. There are always projects that I wish we could reshoot or edits I would change. One of the hardest shots to get this time was the cover. Last time, my publisher was very clear that they wanted an older photo of Georgia for the UK edition of Crochet at Play. This time, however, we wanted to show some of the more gift elements of the book, so we shot a number of set ups for potential covers. The lime green with cushion and booties was very nearly the cover, but it was important to convey the book wasn't just baby gifts, so the photo of our model Chelsea in the Slouch and Bobble Hat was picked. I am off to pack up all the pre-orders and get them to the post office!! See you tomorrow for launch day! The day is almost upon us! My 2nd book Hook, Stitch & Give is out on Thursday, my birthday is Friday and the book launch is Saturday, so that basically means its party week here, right? In advance of Thursday, I thought i'd tell you all a little bit about the making of the book. I started work on HSG in March 2013. The book had already been laid out in my book proposal to my publisher, so it had some flesh on it before I sat down to design. 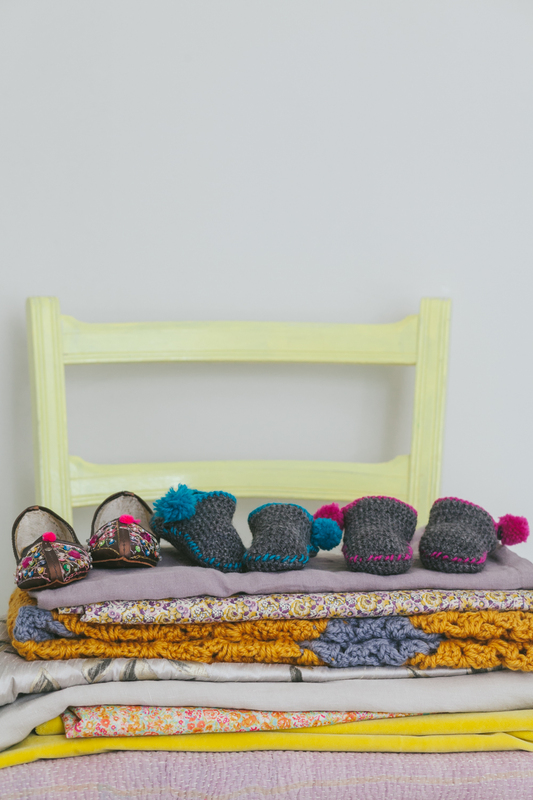 With innovative projects to meet a range of skill levels, Gifted Crochet will contain patterns that make a gorgeous addition to any home or wardrobe. The overall feel of the book will be elegance – beautiful drape, natural fibres and a sophisticated colour pallet. . 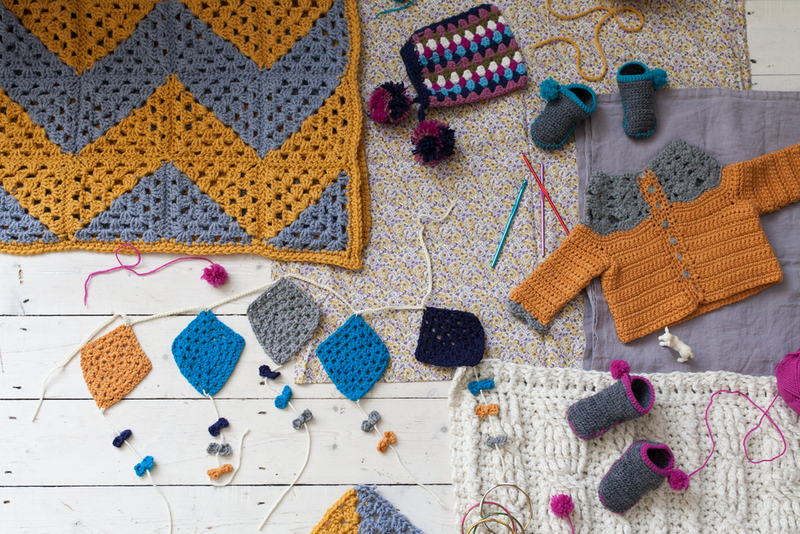 Many crochet books of this genre focus on the kitsch and cute side of crochet, whereas Gifted Crochet aims for beautiful. Strong, on-trend design, cohesive colours and beautiful photography will set the book apart from many other crochet titles. While I do tend to stay away from Pinterest when I am in the throes of designing, I do use Evernote to stash ideas for designs all the time. It has become my go-to source when I begin desiging anything. My vernote file for the book contains everything from design ideas I like, construction methods I want to explore and colour palettes that I like. Speaking of colour...one of the things I am keen on is keeping a tight colour palette throughout my books. I think this helps with creating a flow throughout the book and means that when you look at my Ravelry page (which acts as my portfolio), you see a cohesive collection. It also makes looking for location houses for photoshoots and styling a bit easier. For the book, I took inspiration from Libby Summers' Fine Aran yarn pack (which is used in the book a couple of times) and Mini Modern's paint collection. Most of the patterns were written in my usual way of sketch, swatch, write, make, edit. I try to start with the most complex items first, so that I don't run of of time and energy later. However, even with a basic plan, it is so easy to see a deadline that's months away and think "oh, I'll design that cardigan later" which happened a lot. However, I did steadily work on designing some of the key pieces of the book. Each Autumn, my publisher goes to the Frankfurt book fair where it takes samples of upcoming books for other publishers who may want to purchase the rights for their country. For August, I designed a capsule collection of 10 items for a photoshoot and provided text to the fabulous Louise Leffler - who has designed both of my books. This preview (called BLADS - book layout and design) was a great way to get a third of the book done and get started on testing and tech editing. It also gave me a chance to touch base with my editor Vicky Orchard and discuss the rest of the book. As much as I would like to say that writing the book was a breeze, truth is it is easily one of the most stressful things I've done. Running up to August 2013, Kevin and I largely split childcare between us, with the little ones in nursery a couple of days as week. However, writing the book and making the designs takes a lot more than that. Our days were exhausting - I would watch the kids during the day, stealing off to work when I could, then Kevin would come home and I would run upstairs to start work in earnest. we hardly saw each other and felt like we were in a constant struggle of "who gets to work more". This was our routine for almost 3 years. By August, we'd hit a wall and decided that we needed more help in the form of an au pair. With the help of Dalia, somehow between August and the 31st December deadline, everything got done, tech edited and mostly tested and we still ate, wore nominally clean clothes, organised a move and taught 200 people to crochet at the Country Living Fair. We celebrated the new year by sleeping through the whole thing.